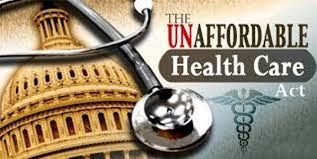 As the Affordable Health Care Act continues to blunder its way into the lives of all Americans, more problems arise, and the latest issue is hitting middle-class individuals and families right in the pocketbook. Low-income families qualify for subsidies from the government to help pay for health insurance coverage. However, those who do not fall into the category of income that is not more than 400% of the federal poverty limit — $47,780 for an individual or $61,496 for a couple — do not qualify for subsidies to buy insurance. In addition, they cannot find a health insurance program that is affordable. These middle-class folks are stuck between a rock and a hard place. According to USA Today, more than half of the counties in 34 states utilizing the federal health insurance exchange do not offer even a bronze plan that's affordable for middle-class Americans. Recall, the federal exchange has plans that range, from highest to lowest, platinum, gold, silver and bronze. What is considered affordable? The government's definition is 8 percent of one's income. The options for middle class families often include either buying catastrophic insurance with high deductibles or opting out. They can opt out if the cost of insurance is over 8 percent, but that is not what they want. They want the protection and peace of mind that comes with having health insurance coverage. But under the new Affordable Care Act, this does not seem to be working in their favor.